Having a hard time getting into the holiday spirit? 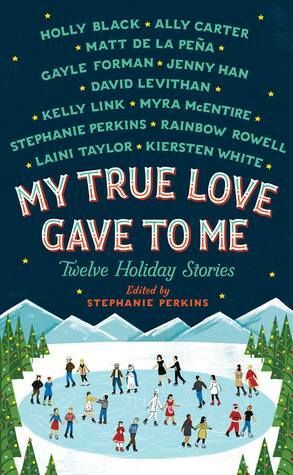 Well, look no further than this collection of adorable, heart-warming holiday stories! This collection of stories is great for a number of reasons, but I especially liked the variety that it presents in both the authors and the content. Even though these authors are united by the fact that they have written works in the young adult genre, they write about different topics within that genre. For example, Allie Condie is the author of the Matched trilogy, a dystopian science fiction story, while Holly Black is well-known for her many fantasy novels. Their genre preferences are noticeable in their short stories, which means that each one has a unique little twist to it. I expected them all to be just regular contemporary romance stories, but there were a few that surprised me with their fantasy elements and magical surrealism. There is also a lot of diversity in the content itself, meaning that the settings, characters, and even holidays vary from story to story. There are many Christmas stories, but some focus on other holidays, such as Hanukkah. And then there are those that don’t even revolve around a specific holiday- they simply take place during the holiday season. I genuinely enjoyed reading all of these stories, which doesn’t usually happen often when it comes to collections of writing. Usually there are a few that I’m only lukewarm about or that I even dislike, but I am happy to say that I was really impressed with all of these! The three that really stood out to me were “The Lady and the Fox” by Kelly Link, “Angels in the Snow” by Matt de la Pena, and “It’s a Yuletide Miracle, Charlie Brown” by Stephanie Perkins. I loved the first one because of its fantasy elements, and the other two because of their adorable and really well written romantic relationships. I was surprised when I realized that two out of my top three favorites were written by authors that I have never heard of before- Kelly Link and Matt de la Pena. I’ll definitely have to explore more of their writing in the future! Overall, I highly recommend this collection of stories, especially during the holiday season! It’s sure to give you that warm, fuzzy feeling inside, even if it’s snowing outside! Would I recommend it to a friend? : Absolutely, especially if they’re a fan of one of these authors or the YA genre in general. Have you read this book before? What did you think of it? Got any book recommendations by any of the authors included in this collection? Let me know in the comments section below! Aw this is cropping up so much in my book reviews feed that I feel like I REALLY need to get my hands on it!